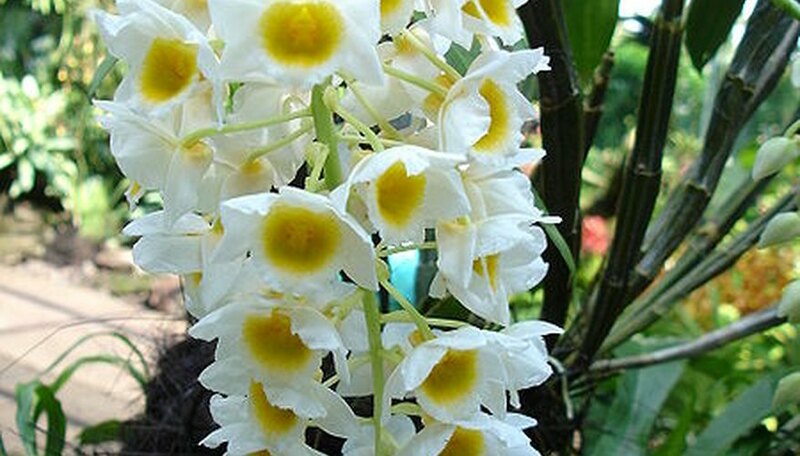 Dendrobium orchids are the second largest genus after bulbophyllum, with more than a thousand cultivars and hybrids. Dendrobium orchids produce a single long arching flower spike with multiple blooms on each spike. The stems of dendrobium orchids are green, segmented, crenelated and resemble a fleshy bamboo cane. As ephiphytic orchids, dendrobiums grow in a very loose planting medium with good airflow, little moisture and bright indirect light. Provide consistently bright, indirect light for your dendrobium orchid. Keep out of direct sunlight when in bloom to prolong the life of the flower. A few hours of direct daily sunlight when the plant is not in bloom will help induce next years flowers and new stem growth. Water your dendrobium when the medium is dry and the pot feels light. This can be at intervals of a few days to nearly two weeks depending on the climate and plant. Drench the orchid by running it under a gently flowing faucet running tepid water. Soak the plant and medium for a minute and allow the excess to drain away before placing the orchid back on its saucer or in its decorative pot. Feed your orchid once a month after watering thoroughly. Use a high nitrogen orchid food or general purpose fertilizer such as MiracleGro, Peter's or Schultz's. Dilute the fertilizer formula with water according to the label directions and pour through the plant, slowly covering the already wet medium and the roots well. Prune your dendrobium bloom spike after it dies back and becomes a crispy brown twig. This allows the nutrients stored in the flower spike to flow back into the plant stem and roots. When leaves are damaged or begin to wilt, also allow them to yellow and die on the plant. Pull leaves off only when they come away from the stem with just the gentlest tug. This will prevent damage to the main plant stem as well as recharge the plant. Repot your dendrobium every two to three years into a pot that is an inch or two larger than the last. Carefully pull the plant form it spot and release all of the potting medium that is stuck to and entangled in the roots. You can rinse the roots in tepid water as this will make them pliable and make the material easier to remove. Fill the new pot with an inch or two of a fresh heavy textured orchid medium containing bark and charcoal. Set the plant in and fill in more medium around the roots. Water well, allowing the medium to settle adding more as needed.